« Descendants at the Female Factory. The beautiful Atrium at Hadley’s Orient Hotel was a perfect setting today for Harriet Bayly of Runnymede to meet an unexpected guest – Roald Amundsen fresh from his success in being the first to reach the South Pole! We had a large group from Expanding Horizons from Adelaide in Hobart for the Wooden Boat Festival. This was our first booking for this new play Harriet @ Hadleys and we hope it will be the first of many. It was a perfect fit for the Festival with its tales of birth at sea and adventures in the Antarctic. Fridays and Saturdays @ 2pm. 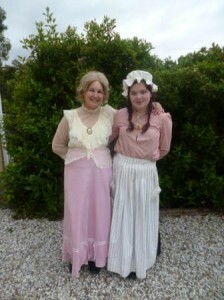 Harriet with Her Maid, Grand Daughter, Holly!